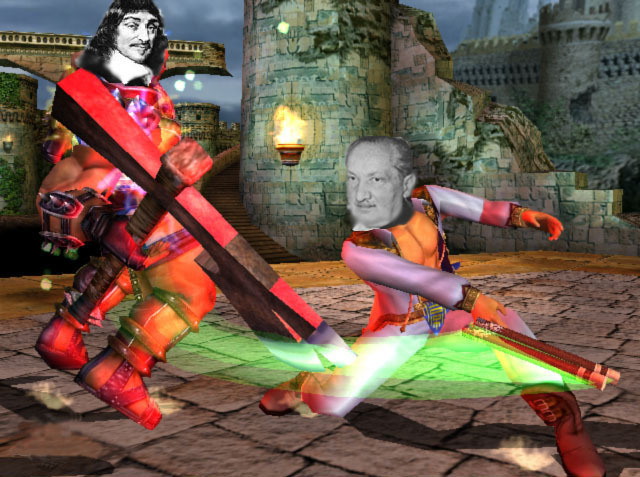 Drunken Pirate Software Proudly Presents - Philosofighter! You've sat and imagined it. You may have written a paper or a thesis on it. It's the question that's hounded you for years, that nagging feeling that's kept you awake all those countless nights. 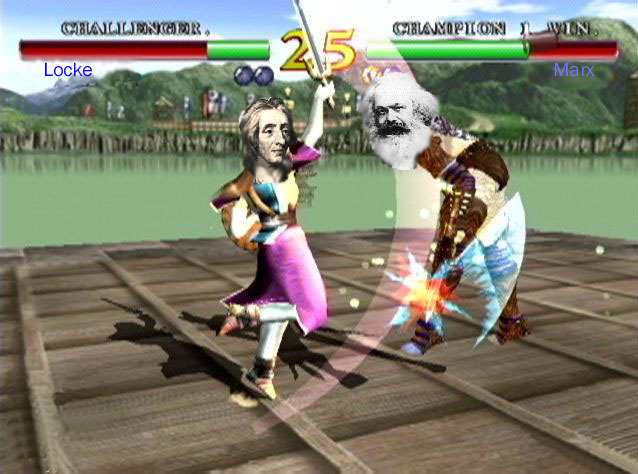 "What if the greatest philosophers in the Western Pantheon could all meet in one place and challenge each other to a fight? Who would win?" 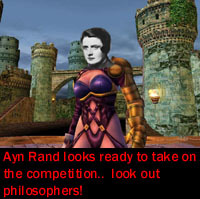 CHOOSE FROM SIXTEEN DIFFERENT PHILOSOPHERS, EACH WITH THEIR OWN UNIQUE MOVES, WEAPONS, AND FATALITIES! 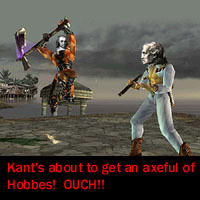 Ever wanted to watch Kant pound the stuffing out of Ayn Rand? 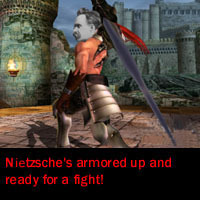 What about Nietzsche battling Plato? In Philosofighter, you can choose your favorite philosopher and finally give that depressing Hobbes a beating he won't soon forget. All screenshots are downloadable - just click on them to go to a larger version! Philosophers to choose from include: Nietzsche, Heidegger, Descartes, Kant, Hobbes, Ayn Rand, Plato, Aristotle, Augustine, Aquinas, Locke, Marx, Jesus, Muhammad, Bentham, and Hegel. That's not all! 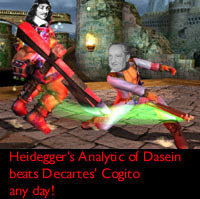 Philosofighter uses the latest in 3-D Technology! Tired of games that only offer minimal 3-D support? Drunken Pirate Software's crack team of award-winning 3-D artists have created a game that pushes the very boundaries of the 3-D space time continuum! That's right, we applied the latest 3DFX-TNT2-RIVA-VooDoo Graphix-Enhanced motherchips to Philosofighter, making it one of the most beautiful games ever rendered on a game system before! The Dreamcast's hardware is pushed to the limit by the 36 billion onscreen polygons, and the blood effects are the most realistic ever to be created for any video game. For working out those aggressions, there's nothing like a few rounds of Philsofighter! Philosofighter's multiplayer support is unparalleled! Philosofighter offers not only an outstanding single-player gaming experience, but rocks in multiplayer as well! 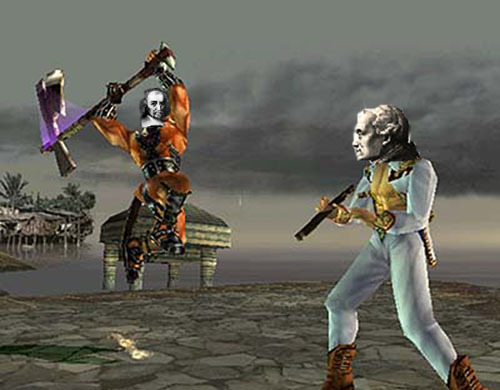 Up to four philosophers can challenge each other at once in an all-out, no-holds-barred melee, or take on your friends in a four-philosopher tag team bout! One-on-one matches are also supported, as well as a grueling "Grudge Match" mode for the truly brave. 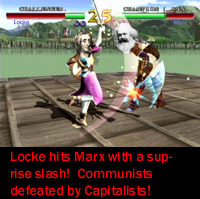 The critics agree - Philosofighter is the greatest fighting game of all time! Read what these video game critics have said about Philosofighter! Don't Delay! Order your copy of Philosofighter today! Drunken Pirate Software is proud to offer Philosofighter exclusively through our website. Click here [NOTE: LINK NO LONGER ACTIVE] to go there now, and order your copy of Philosofighter. 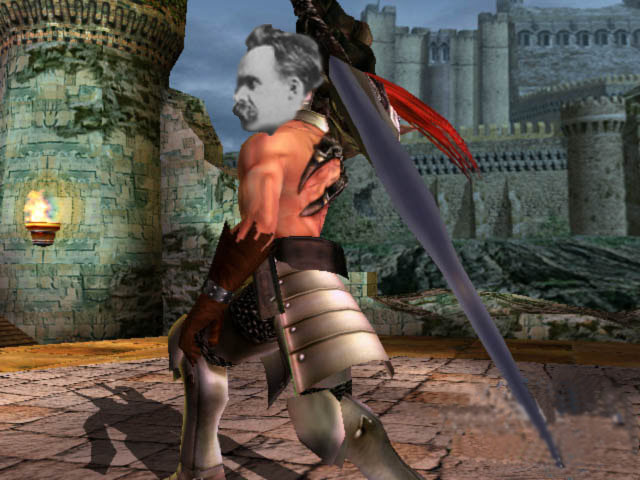 Note: Philosofighter requires the Sega Dreamcast system to operate. BACK TO THE CRAZY STUFF! - it's how we continue making high-quality software!